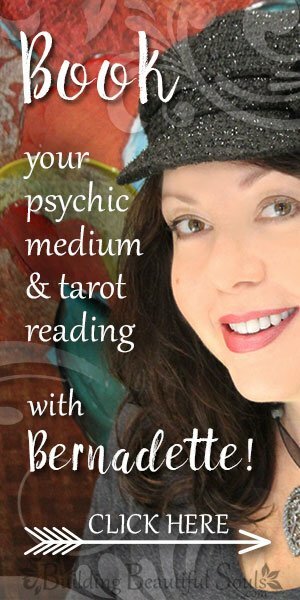 The Fool tarot card symbolizes the self’s complete surrender to the divine source. 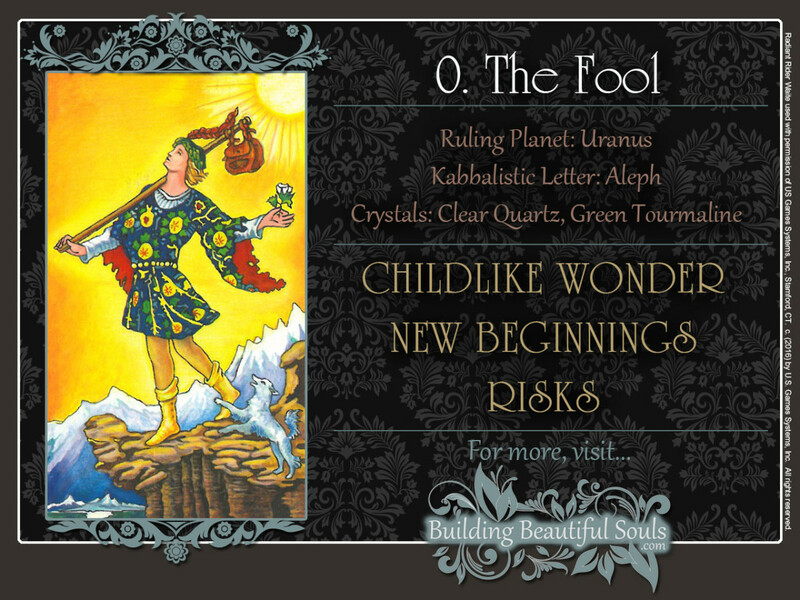 The Fool card’s key meanings are beginnings, childlike wonder, & risks. But this young optimist is no dummy. Yes, The Fool steps out into the world as an act of unconditional faith – but this faith is not blind. The white sun against the yellow sky shows that what is happening in the Fool tarot occurs at the highest levels of spiritual experience, the sun representing the divine source and pure spirit, while the sky symbolizes the highest reaches of human spiritual understanding. The Fool leaps into the (yet) unknown is the result of many experiences and lessons learned. Looking at the full context of the Fool tarot card, this is a step into the next great mystery. It’s a natural result of everything that has been leading up to this point. The Fool isn’t inexperienced, ignorant, or powerless. His knowledge just can’t help him any further. The Fool tarot carries the symbols of his power and knowledge, the staff and pouch, over his shoulder. He has no use for them now, but The Fool is wise enough to know that they’ll come in handy later. In the Fool tarot, he holds a white rose, symbol of divine love and the Fool’s devotion to his chosen path. The Fool’s tunic is embroidered with 10 circles, the divine emanations of the Hermetic Kabbalah. The white dog at the Fool’s heels represents complete mastery over his natural instincts. The fact that he is urging the Fool to step off the precipice, the limits of human experience, suggests that taking this step is a natural instinct. The end of one journey is only the beginning of another. The mountains in the background of the Fool tarot suggest that there’s much for the Fool to explore in still higher regions of awareness. Fading from dark blue to white, they signify that the next journey is a purely spiritual one. Having experienced, learned, and accomplished everything you were tasked with, you realize that the journey has only begun. Reflecting on your past travels and ordeals, you are filled with a sense of joyful anticipation, rather than exhaustion! As you wonder what’s next, you understand that your own power and understanding cannot help you further. The divine source has brought you this far; you know you can trust it. Interestingly, this is exactly what your life feels like right now. Having learned and accomplished everything there was to discover and do, you are standing at the threshold of an entirely new mystery. While others expect you to shout, “Eureka! I have found it,” you pause and mumble under your breath, “Wait a minute. That’s funny.” What those around you think is strange is that this insight does not bother you in the least. Admit it, deep down that’s exactly what you expected. Haven’t you been packing your things for this new grand quest for quite some time? Having completed an important cycle in your life, you take a quick breather before you begin the next. This cycle will spell a radical break from your previous life, having almost no resemblance to it at all. Even close friends and family will have a difficult time understanding the decisions you are now making. In fact, they may warn you that you are taking foolish risks. For example, you may have decided to move to another country. Or you may leave a well-paying and secure job to start your own business. Perhaps, you’ve decided to no longer keep your sexual identity a secret, or you are now fully devoting yourself to your spiritual pursuits. This is the type of perceived high risk decision you have made. Others would shy away from it, but you are filled with a calm sense of certainty. After all, you are being guided by a higher source, and everything in your life has prepared you for this moment. When reversed, The Fool tarot card warns of either hesitancy and fear or carelessness and rashness. The fool is associated with the Element of Air, and soaring and falling tend to feel the same – for a while, anyway. Remember that the Fool card shows the moment before you take the leap. This is a time for reflection, followed by acceptance. It is a brief moment, a moment in which you need to review important things before moving on. Imagine that you are about to step out the door to catch a plane to a different part of the country, and you are reviewing your checklist one more time. Is the stove turned off? Does the cat sitter have your house keys? Have you packed everything you’ll need for your trip? Do you know where your plane tickets, wallet, etc. are? If you worry about these things all day, you’ll miss the plane, but once the plane is in the air, they better be taken care of. The pilot won’t turn the plane around just because you forgot your vacation money in your drawer. As far as hesitancy is concerned, history is full of examples of great novels never written, timeless masterpieces never painted, and powerful spiritual teachings never taught. When faced with this life changing decision, those inspired writers, artists, and teachers chose to turn their backs on their calling in favor of a life of relative security, but quiet regret. In so doing, they also deprived the world of important gifts that would have enriched it. Yes, there is some risk involved, but you were meant to use your gifts. Carelessness is the flip side of hesitancy. Therefore, it is important to look before you leap. You’ll know the time is right when your sense of clarity is stronger than your desire to proceed. But as long as desire outweighs everything else, it can blind you to that fact that you may still need to resolve important issues. The Fool tarot is the zero-card. Visually, this number represents infinity and the divine source. It also represents nothingness; the next part of the journey cannot be experienced in our present form. 0 also represents the sacred (and therefore: secret) nature of the Fool card’s mystery. In older decks, The Fool tarot was actually “tucked away” between The World and Judgment tarot cards.